As part of our campaign to raise awareness of the profitable growth opportunity for Resellers (MSPs, SI etc) associated with selling more products and services to their existing customers rather than predominately following a new-business strategy, we canvassed the views of Vendors, Distributors and Service Providers right across the tech industry. Here’s what they had to say. We all know that it’s easier (and cheaper) to sell more products or services to existing customers than it is to find new ones. That’s why it surprises me that more airtime isn’t given to this topic. Often, it’s worth going back to basics and asking your customer “what does success looks like?” because this will lead onto the next logical conversation. Using Oracle NetSuite, you can easily monitor the profitability and buying trends of your customers and identify the most sensible cross-sell and up-sell opportunities, turning these into actionable sales and marketing campaigns. Turning this real-time visibility into actionable insights across your customer base is the key to unlocking the value hidden in your whitespace. Whitespace selling (or cross/up selling) remains one the greatest untapped areas of business opportunity; in fact, Accenture say that 80% of businesses are squandering the opportunity when it comes to effective B2B Account management. In addition to the often untapped opportunity, it’s worth pausing for a moment and consider that whatever you sell will at some point either no longer exist, will change or will be commoditised. It’s reality. The best way to avoid being commoditised is to add value to what you sell and in so many cases the best value is in cross selling. Provide one place to bring your entire relationship to life so your client can see your community, business reviews, contract data, service data, added value and of course, can see what you do in the whitespace - That’s the Client Share difference! We work with hundreds of Partners and the really successful ones are those that take a solution-led approach to their sales and marketing. By packaging together a few of our complementary products Partners are able to offer more value to their customer while maximising the cross and up sell opportunity. That's the best way to address the whitespace opportunity. Partners are better off putting themselves in their customer's shoes and thinking what their customers really want - which is great service wrapped around a great solution - that's what Westcoast Cloud is about. Whitespace has been around the channel for years and is really easy to fix - you just need to take a step back, think what you want to be famous for, work with us in partnership and let us help you get there quickly and profitably! At the end of the day, customers want fewer partners to work with so the more we can help them, the better it is for everyone. At Bluesource we certainly see the benefits of focusing our sales and marketing effort on our existing customers. Not only is it less expensive, but it also helps us be more strategic and important to them. We're fortunate that we've been around a long time and have some great customers to focus our efforts on, which is not the case for newer companies, but even the newer companies can adopt a solution-oriented approach. A whitespace strategy is as much about locking out the competition as it is about making incremental profits, as the more things you can sell a customer, the less things there are for a competitor to sell them. We are a channel-first Managed Print Business that gives Resellers & MSPs an out of the box service they can take to their customers. As such, the partners we work with actively promote and benefit from selling our Managed Print Services, which helps them build stronger, wider and deeper trading relationships with their clients. I think a whitespace strategy is all about where can you create exponential value for your customers – whether they are VARs (in our case), or end customers. Our role, as a specialist Office 365 Adoption and Change Management services provider, is to first help our partners to understand the value we can bring to them, but then make it really easy for them to attach our services to their Office 365 sales, with the objective being to help increase customer usage and satisfaction of Office 365 which in turn will create incremental up-sell opportunities. This BI-led engagement approach allows our partners to have meaningful conversations with their customers that are backed up with substantiated data. This helps shorten sales cycles, increase the value of the partners we work with, and helps our partners build much deeper relationships with their customers. 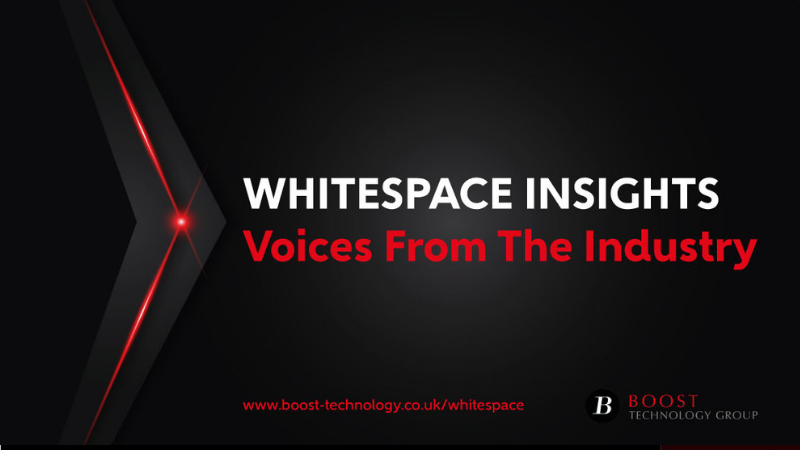 To learn more about developing a whitespace strategy, visit www.boost-technology.co.uk/whitespace or contact us.